We have reached and passed the half-way mark! 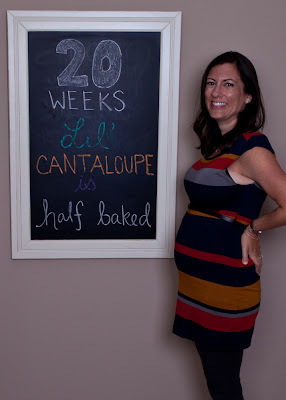 Baby is the size of a small cantaloupe, oh my goodness! Baby was measuring big at our sonogram last week - in the 84th percentile! I also found out that baby's placenta is on the outside (an anterior placenta) which is cushioning baby's kicks and movements. So while I can feel some movement, we can't feel it from the outside yet. Hopefully soon! hooray for being halfway there! you look BEAUTIFUL! hope you're feeling well. Thanks y'all! Second trimester is THE BEST! !